Osteopathy is a system of manual therapy, using a long-established and recognised system of diagnosis and treatment, which promotes good health of the musculo-skeletal system. It takes into consideration all aspects of a person’s health, and aims to address the reasons for the problem rather than just treating the symptoms. Osteopaths work with their hands, which means I individually tailor each treatment to you, the patient. I constantly monitor tissue changes by selecting the most appropriate techniques to help your body return to normal function. Osteopaths work on person as a whole, therefore I ensure I address other factors that may have contributed to, and may also prolong your problem. 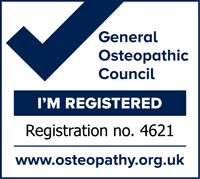 For further information about osteopathy, you may find it useful to browse the details on the websites of the Institute of Osteopathy (www.iosteopathy.org) or the General Osteopathic Council (www.osteopathy.org.uk).